Soak green peas in water overnight. Pressure cook it by adding salt and enough water and keep aside. Grind ginger, garlic and green chillies together and make a paste. Cook sliced kovakka pieces, tomato, onion, ground paste and turmeric powder together with water and salt in a pan. 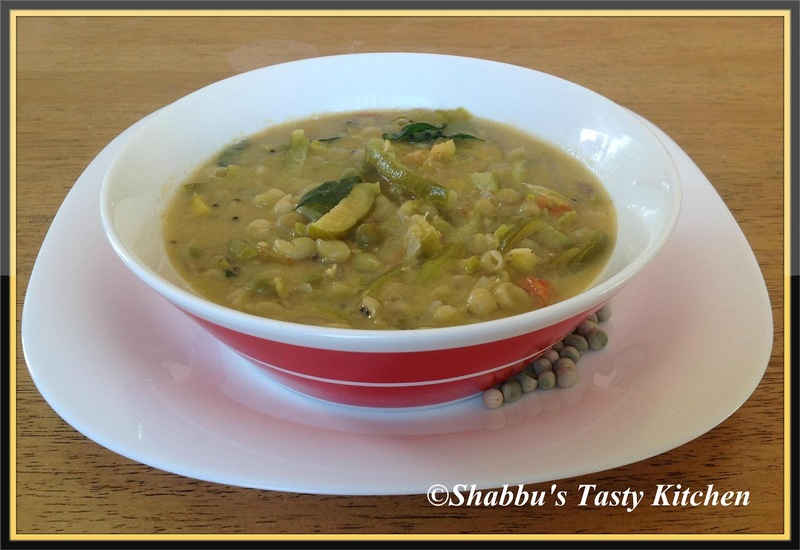 Add cooked green peas and sambhar powder to this and mix well. Allow to boil. Finally add thick coconut milk and boil for 2-3 minutes.Adjust the salt. wow.. it looks very yummy.. never heard of kovakka curry.. I never made green peas and ivy gourd combination. But your recipe sounds delicious. nice one dear. Never tried this combo. Looks delicious. Curry looks delicious..I have never made this combo. Never tried this combo,looks yum,bookmarked. Definitely an interesting combo..delicious curry. I don't know if you've visited my new vegetarian food blog (cooking and baking) but if you haven't - I'd like to invite you (you can enjoy it even if you're not vegetarian). Very interesting combo n the surry sounds so yummy with coconut milk...thanks for the recipe will try it sometime! looks so simple and tasty. Never tried peas and kovakka. Thanks for sharing the awards Shabana...I have picked them up and linked you back here. nice interesting different combination of ingredients..